In terms of distance and coastline features , this sea kayaking day trip at Ag. Nikitas, in Lefkada island, could be characterized as of rather easy to moderate trip, while the paddling distance is of approximately 7 Nm. Launching our sea kayaking trip from Agios Ioannis, we head south exploring this beautiful NW stretch of Ionian coastline. Agios Nikitas village is on our way south, along with interesting rock gardens, quiet beaches and small sea caves. We opt for two breaks on the way, enjoying our lunch, consisting of fruits and some of Greece’s most tasteful traditional products and we finish our sea kayaking day in Kathisma beach. 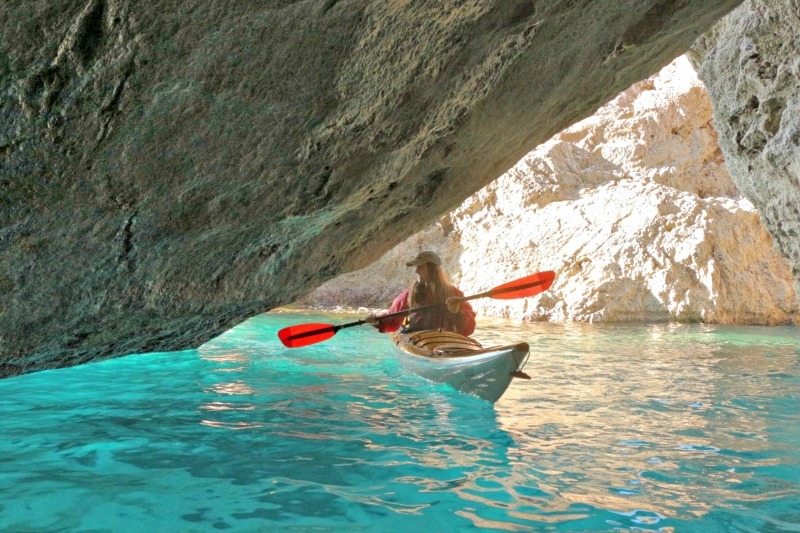 Light colored limestone cliffs and rock formations, turquoise water, caves, blowholes and an isolated beach for our lunch break comprise this sea kayaking day trip at Agios Nikitas, in Lefkada island – a “must do” adventure to experience during your visit to Greece.